Published by jalbertini on December 1st, 2018 in Climate Change, Farm, Hawaii Independence, Military, Social Justice, Take Action!. Once a year, we write to ask for your help to sustain the work of Malu ‘Aina for justice, peace and a living planet. We are grateful for whatever donation you can make. Malu ‘Aina has been planting seeds and sharing food with people in need for nearly 4 decades, feeding many thousands. 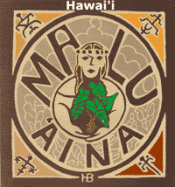 The spirit of Aloha ‘Aina (Love for the Land) and non-violence have guided Malu ‘Aina all these years. 2019 will mark 40 years since our small non-profit organization was formed and Bernard Punikaia of Hale Mohalu/Kalaupapa blessed our farm with the name Malu ‘Aina meaning Land of Peace. From the outset, it’s always been our vision to stay small as an all volunteer organization with no government or corporate funding to maintain our independence. As the late Hawaiian activist Kekuni Blaisdell said, instead of big pyramid organizations, we need lots of small “kipuka of resistance.” Like an old growth kipuka ecosystem, where many species interact and depend on one another, so too it is with movements for social change. We know we can’t do it alone. It takes shared commitment, volunteer people power, and the solidarity of your donations to carry on. Besides financial donations, right now we could use a volunteer with carpentry skills for a few days to help replace two shed roofs. We have all the materials and are ready to go. At age 72 common sense tells me my roofing days should be over. I better stick to ground level support activity. This year has been especially difficult for us located in the Puna district of Hawaii island. Kilauea volcano lava flows have changed Puna forever. We were very fortunate not to be in Pele’s path but the near constant earthquakes for several months during the eruption, and 52 inches of rain in 3 days have taken their toll. We had to redo cement foundation pier blocks on a couple buildings and clear a major water drainage way through our farm clogged with debris. During this special time of the year we remember dear friends and supporters who have passed on. Like you, they have been an important part of Malu ‘Aina. We thank all of them, and all of you, for solidarity in life’s precious journey. Presently, and looking toward the future, the stakes couldn’t be higher. Our planet is in climate crisis with intensifying storms, fires and other weather extremes. Violence, hate, economic disparity, wars and displays of militarism are all on the rise. Hawaii, already one of the most militarized places on the planet, is now facing proposed Military Special Ops training on our beaches, and parks. It seems one of the hardest lessons to learn is we cannot bomb, kill, and exploit our way to a world of justice, peace, and respect for the earth and one another. In such time, work for justice, peace and respecting the sacred is more important that ever. We are in this together. Your support keeps us from being discouraged. We pledge to never give up. Blessings of this holy season to you and your loved ones. PS. Donations are tax deductible if checks are made to Center for Non-violent Education & Action P.O. Box 489 ‘Ola’a (Kurtistown), Hawai`i 96760. A Pay Pal account (Donate button) has also been setup on our webpage www.malu-aina.org as another convenient way to make donations. On the website, please click “Subscribe” to receive the Malu ‘Aina weekly peace vigil leaflet (now nearing its 900th week) and other posts for peace, justice and the environment. Other contact information: Phone (808) 966-7622. Email: ja@malu-aina.org Mahalo.